Growing up in a household where both of her parents were medical and science professionals, it’s no surprise that Gillian Beamer, VMD, PhD, DACVP, followed in their footsteps. Her mom is a veterinarian, board-certified in laboratory animal medicine; her dad is a scientist. Looking through a microscope at a young age was commonplace. She recalls her dad once telling her he liked being a scientist because he ‘enjoyed learning new things every day.’ For Dr. Beamer, that was all she needed to hear. 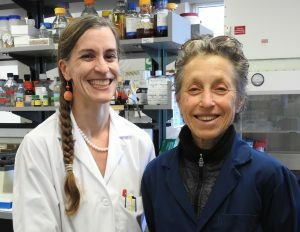 Dr. Gillian Beamer (left) in the lab with MSIDGH student, Justine Bruner (right). Today, at Cummings School, Dr. Beamer wears many hats. 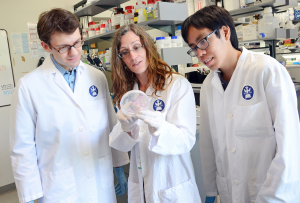 As an assistant professor in the Department of Infectious Disease and Global Health (IDGH), she teaches both graduate students and veterinary students, focusing on immunology and respiratory-related infectious diseases. She is also part of the diagnostic pathology service at Foster Hospital for Small Animals and teaches pathology to veterinary residents and veterinary students. There aren’t too many adolescents who know they want to be a pathologist when they grow up. Dr. Beamer was mentored by a veterinary pathologist and scientist at a young age, and, fascinated by the work, she decided in high school to pursue a career in pathology. To achieve this, she had two paths to choose from—medical school or veterinary school. Ultimately obtaining a veterinary medical degree from the University of Pennsylvania, it was important to Dr. Beamer to practice what she had been taught. She subsequently a completed small animal medicine and surgery internship and worked as a small animal practitioner for several years. Fascinated by the work of a mentor, Dr. Gillian Beamer decided to become a pathologist in high school. Thinking back, she credits, in part, her first job as a relief veterinarian at the North Shore Animal League as a key influence on what she does today. Functioning more like a hospital than a shelter, Dr. Beamer often saw animals become sick and die of vaccine-preventable conditions. This further ignited her interest in understanding the mechanisms that cause disease so that she could develop novel treatments and therapeutics to save these animals. The experience also helped her realize that there are large differences between what clients and veterinarians want from a pathology report. That, she says, has made her a better pathologist. Dr. Beamer, like her father, has always been motivated by the desire to learn. After working at the shelter for a few years, Dr. Beamer proved she was up for yet another academic challenge, doubling up on getting her PhD and completing a pathology residency at The Ohio State University. 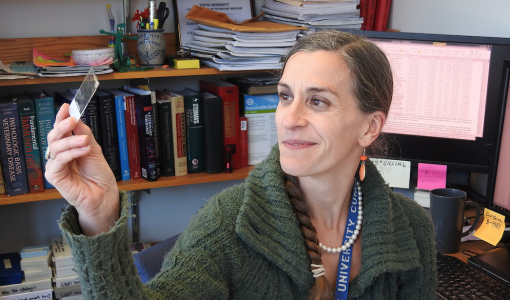 individuals differ in their response to the bacteria that causes tuberculosis (TB), continues to drive her research today. 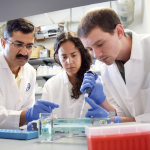 Looking at differences in TB-resistant and TB-susceptible subjects, Dr. Beamer is actively focused on how an animal’s immune response fights the bacteria. Her hope is to someday translate her findings to humans. “In many ways, we share similarities in responses to TB with animals,” says Dr. Beamer. Her motivation to do research is two-fold. 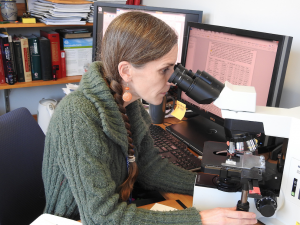 First, she is able to effectively combine all of her pathology, veterinary medical, and cell biology expertise to identify and solve problems that may contribute to advancements in the TB arena. Second, she knows that there is still a lot to learn to eliminate the suffering. “Millions of people are newly diagnosed and continue to suffer from TB across the globe. It remains a stigmatizing and frustrating disease,” says Dr. Beamer. “Dr. Beamer is an astute investigator, an excellent and meticulous pathologist and outstanding and effective course director and teacher. 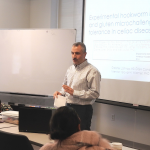 She has a captivating and cheerful demeanor and the department and school are fortunate to have her,” says Saul Tzipori, DVM, PhD, DSc, FRCVS, Chair, Department of Infectious Disease and Global Health. Dr. Beamer adjusts her teaching style to fit her students’ needs. As a faculty member for the IDGH master’s degree program, she recognizes that everyone learns differently and adapts her teaching approach as needed. Dr. Beamer wants her students to succeed, offering an open door policy and bringing some out of the box techniques to the classroom, such as using Play-Doh to teach topics of a three-dimensional nature, as well as microbe stuffed animals that make learning about different disease pathogens fun. “Not only is Dr. Beamer generous with her time and empathic, but she also clearly recognizes that each student has his or her own learning and thinking methods. Her lectures are organized, always laying out objectives and a concluding take-home message,” says Justine Bruner, MSIDGH ’17.